You know when you ask someone out (or get asked out) on a date and you get all hyped up? That’s how I felt in June heading into July. Then I showed up for my date night and the other person didn’t arrive. I set lofty goals for July which I think you should always do for your blog. The problem was that I didn’t take into account a life change. In July, we moved to Henderson, Nevada and for some reason, I thought the mental and physical toll that moving would take on me wouldn’t be that much. In a sense, it was kind of like going on vacation and then trying to head back into work. My mind was always elsewhere and I couldn’t sit down at the computer for longer than an hour at a time. I completely lost my flow and I didn’t really get it back until the last week of July. By no means is this an excuse. I should’ve done a better job of tackling these things, but that’s what happened. Now most of these goals are utterly insane for just the 2nd month of a blog’s existence, but I knew I could do it assuming there were no distractions. Well, I must tell you that moving to a completely different state is a huge distraction. As you can see, I was successful with one goal. The reason I created these lofty goals was because I wanted to strive for them and see what my failings were, correct them, and then strive for them the following month. Setting easy goals doesn’t push you to where you have to start thinking outside of the box and also learning how others before you did things. Ignoring the fact that I did a major move what were the other hiccups that held me back in July? One stands out and it’s the one I want to talk about. When it comes to creating a popular blog you need an audience. That audience doesn’t appear out of thin air. Some bloggers take years to build up their audience on their own and that is a solid way to do things, but it’s also the hardest. There is no reason why you need to avoid doing things the easy way and the easiest way to build up an audience is by leveraging your connections. Assuming you are just getting started then you have no connections and this means you need to start networking. Get your name out there and start helping other bloggers. This is what I failed at in July. While I started to build up a connection or two in June, that completely fell apart in July. In August, the goal is to help other bloggers directly and build up a number of beneficial relationships. Let’s focus on the one goal that was successful and that was reaching the 200 follower mark on Pinterest. At the beginning of July, something crazy happened. One of my pins exploded and I can’t tell you why. Someone with some Pinterest street cred pinned this post and it went crazy from there. See that crazy spike at the beginning of the month? That’s what happens when your pin goes mini-viral on Pinterest. Something else to notice is the crazy drop off after just a couple of days. Pins don’t stay viral unless they continue to gain momentum which this one didn’t in this case. How did this spike in Pinterest pins affect Obstacle.co traffic? Because the majority of my traffic comes from Pinterest (at this time remember the blog is only 2 months old), the traffic graph follows the same pattern as the Pinterest chart. When I do well on Pinterest, I do well on the site. Looking at this graph can you take a wild guess on which day I moved? Within the first 10 days, I had over 4,000 pageviews which put me well on course of achieving my 10,000 pageviews goal. In all honesty, I thought I was going to coast to that but because the site isn’t established and I have one main traffic source that I didn’t continue to feed, traffic didn’t keep up. However, I’m glad that I achieved my Pinterest goal within the first week and I look to continue that success this month. Pinterest is hands down the best social media platform you can use for your blog to jumpstart things. Alright, let’s get to the meat and potatoes of these posts. The goal was to make $5,000 in July which is an awesome figure to make on the second month of a blog. Unfortunately, I didn’t crack that number as I executed on almost none of my plan. However, I did make money and was profitable! In July, I put up a Services page to offer some cool services to Obstacle.co readers. The goal wasn’t to start another freelancing business but to offer some high-quality services at an extremely cheap price to help me build case studies for future courses. Five people have taken advantage of my services and this month will be the last month they are offered at just $100. This month I’ve raised the prices and added a couple more services. This is not a long term venture since it doesn’t scale, but it’s nice to help people out at the beginning stages at reasonable prices. If you are looking for a boost to your blog or not sure where to start, check out the services page to see if we might be able to work together. Another thing I did for the last weekend of July was offer something that I called The $1,000 Bet. It was an opportunity to buy all of my future Obstacle.co products for just $197. I sent two emails out to my mailing list without any warning and showed them the offer. 3 people decided to jump on this and they are going to go crazy once they see what they are getting. I honestly didn’t expect much to happen from The $1,000 Bet because I didn’t prime my mailing list. I just dropped the bomb on them so they weren’t prepared for it. This also serves as a nice case study on how to launch properly. No matter what you are working on when you can see some type of progress it helps to push your forward. You also don’t need a ton of traffic (which I don’t have) or a huge mailing list (which I also don’t have). You just need to be reaching the right audience and providing them with the right offer. If you’re looking to make money quickly with your blog that will have a significant impact on the bottom line, then I will always suggest you offer services right off the bat. You can slap ads on your site, but they won’t scale as fast as service-based offerings. Thrive/Strive not only suffered from the move, but also because the crew sat down and planned out the future of the site which meant big things happening behind the scenes. August will be a big month for the site because it is an internal deadline that I set for the team (my wife and my brother) to see if this is something we can turn into a success. How will success be measured? We didn’t set exact numbers, but we need to see an uptick in almost all metrics to continue working on this. Some things work as a team and some things don’t. We’ve had 2 months to work together and now it’s time to put everything together to see if it works. One of the most important aspects of being an entrepreneur is knowing when to bail and knowing when to push forward. Expenses were lower this month since I didn’t have to account for my purchase of the Tailwind’s annual plan. Expenses were a little over half of what they were in June, but still a lot higher than most people would be willing to pay at the beginning of their blog’s existence. I added Edgar and Crowdcast to the mix. Now I need to make sure I put the work in for August to justify paying for these tools. If you are just starting to blog then you could get away with just having your monthly expenses be web hosting. You can start your mailing list building with the free MailChimp plan. $481 in only the second month! I know it’s a far cry from the $5,000 I was aiming for, but who wouldn’t want to earn half a grand with their blog without resorting to ads or sponsored posts after just 60 days? All of this revenue came strictly from people trusting me and my brand. That’s huge and shows that I am on to something here that I can continue to push forward with. 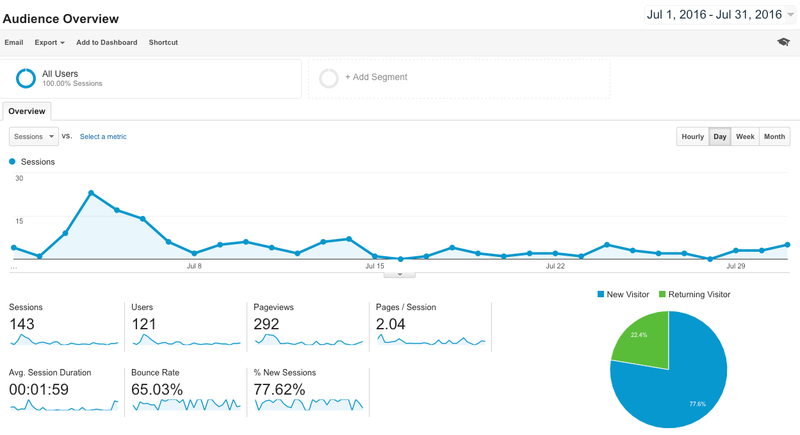 I won’t do a deep dive into traffic numbers this month because nothing stands out. You can see Obstacle.co’s numbers above. 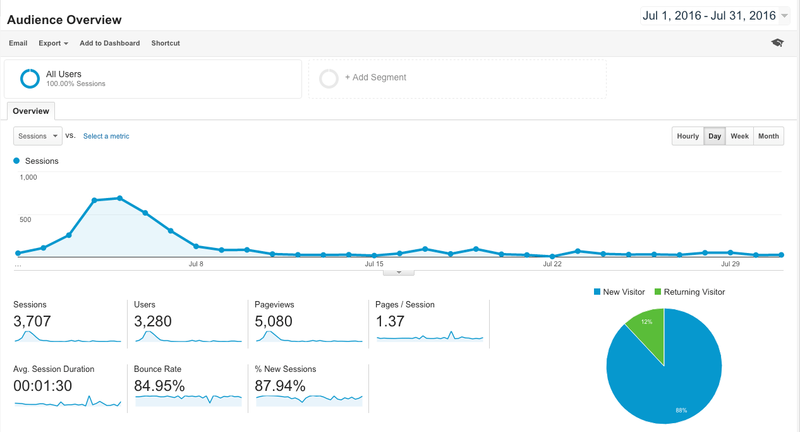 The one thing to note from them is the much higher bounce rate as compared to June. The reason for this is the surge in traffic from Pinterest. A majority of people that come from any social network are going to leave if they don’t immediately see what they want. This isn’t a cause for panic, but it’s definitely something worth keeping an eye on as I move forward. If the bounce rate stays high and the number of subscribers doesn’t increase substantially then some things will have to be tweaked. Again, I wouldn’t look at these numbers with any type of scrutiny since July was a wash. The places that I focused on saw an increase, while the networks that I’ve put no emphasis on, like Twitter and Facebook, didn’t see an increase at all. The goal isn’t to expand my audience across all social networks at once. That is a waste of valuable time. The goal is to master one platform and then move on to the next. My current focus is solely on Pinterest. As you can see the growth of Thrive/Strive really wasn’t there due to the move. July also saw me put on my first three Obstacle.co Webinars. I was excited to give webinars a shot to see how I would do and you usually hear people holding webinars for hundreds of people. I don’t have hundreds of people yet on my list and I didn’t give much notice so I wasn’t expecting much. In total I had 18 people come to my webinars. That’s a super small number, but I enjoyed them. I was able to have great interactions with everyone that showed up and have had a couple of people email me to say they’ve watched the replays and learned a lot. While numbers are important for some things, I’m doing webinars to build stronger connections and to get people to understand both me and my brand. A year from now if I am still doing webinars to an audience of 5 then I will be a bit more concerned. Today’s lesson: don’t wait till you have a big audience to get something out the door. I’ll be running them again in August so keep an eye on the webinars page or be sure to subscribe to the mailing list to stay updated. Okay, time to go for some goals. Do I try to repeat July’s goals or do I lower them? The answer is neither. I’m doubling down and aiming even higher this time! I’m doing this with the knowledge that my in-laws will be in town for a week and it’s my birthday in August along with my anniversary. However, since I’m not moving a U-Haul truck across multiple states these things shouldn’t prevent me from doing what needs to be done. A big thanks to everyone that has sent me an email, shared any of my content, and in general that has been awesome. Blogging is a much easier game to traverse when you surround yourself with good people that appreciate what you do. If you ever need advice, assistance, or anything, don’t hesitate to reach out to me. I can’t make any promises, but it doesn’t hurt to try. You don’t get what you don’t ask for so I’m asking you to take a second to share How I Made Over $600 In My 2nd Month of Blogging with your audience. They respect great content.